To successfully capture the spirit and personality of a horse—its gestures, expressions, and interactions—is the goal Laurie Friesen has set for herself as an equine artist. “Those who admire horses and are drawn to their spirit search for ways to join with that spirit through riding, training, bonding and artistic expression. The horses I have bonded with throughout my life inspire me to paint this type of horse/human interaction. “I have experienced the pride of ownership, the thrill of competition, the joy of a cross-country gallop and the heartbreak of loss. All of these experiences inspire me to paint the horse in ways that will touch the heart of the horse lover. 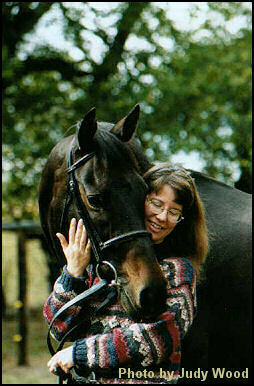 I want them to see in my painting what they feel about horses and are often unable to express in words,” she explains. 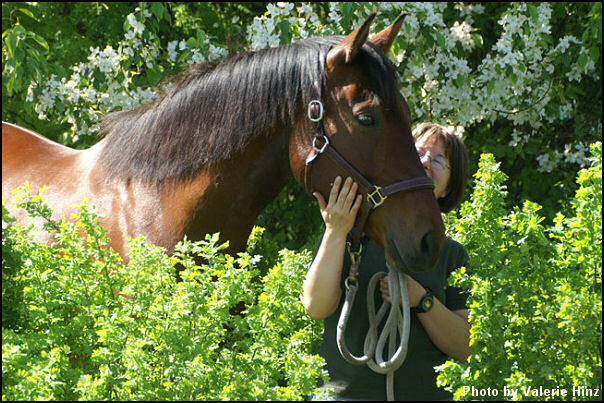 Friesen was born and raised in the city, but her affinity with horses and nature had to be expressed at an early age. Recognizing their daughter’s innate talent, her parents gave her two special gifts she valued immensely: a set of oil paints and a 35 mm camera. At the age of 11 she was thrilled to be the owner of her first horse—an Arab/Welsh pony. She now had all the tools necessary to fulfill her dream of becoming an equine artist. Her first commission came at the age of 13. In high school Friesen excelled in math and science and went on to pursue a Master’s of Science degree in agriculture. She currently works in agricultural research in Saskatoon. “I’m finding the two work together very well. In art, I express the beauty and feel of nature and as a scientist; I work with the actual science of nature. Art consists of a great deal of science—how you use your mediums, the technical aspect of how they work, composition, and how colors contrast, for instance,” she adds. Photography has been a valuable skill throughout Friesen’s career. Early in her art career, she worked for several years as a horse show photographer at which time she collected literally thousands of images which have become reference material and a source of inspiration. Her contacts with horse owners, breeders and trainers have led to both corporate and private commissions from those who want their horses immortalized in a work of art. Friesen prefers to meet the horse owners before going to work on a commissioned piece. This helps her understand the dynamics between the animal and its owner and aids in capturing the ‘spirit’ of the horse. One particularly rewarding commission came from Ron Southern founder and co-chairman of Spruce Meadows in Calgary, the largest show jumping venue in the world. “I greatly admire this man and what he has done for the equine industry in Canada. I was honored to create this painting for him which he was very pleased with,” she says. The piece she did for Ron Southern, ‘Celle Stallions at Spruce Meadows’ is a 16 x 20” painting of a group of highly-trained Hanoverian dressage horses that travelled from Germany to Spruce Meadows in Calgary to perform at the Masters show jumping tournament. Rather than depicting the horses during a performance, Friesen chose a behind the scenes image which brings out their quiet dignity and inherent beauty in a relaxed setting. This painting illustrates how her artistic eye finds inspiration in playing with lighting on both landscapes and subjects. “I love the evening or morning light when you see most of the light spectrum breaking down; how this can affect the overall mood or drama of the scene,” she says. Though highly realistic, Friesen’s work also demonstrates how her use of painterly brushstrokes can add depth and interest, and create impressionistic images that have proven to be very successful to this self-taught artist. She prefers to work in oils which provide what she calls rich juicy brushstrokes. “Oil has fluidity on canvas which allows for more expressive intermingling of colors and expression of light,” she relates. Friesen enjoys shooting photos and spending time behind the scenes rather than in the heat of competition in an arena. “I prefer to sneak around the back where I can get pictures of the rider contemplating what he or she will be doing, or perhaps a moment of rapport with the horse. I look for those images which communicate that human/horse connection.” In her painting ‘A Long Day’ Friesen was able to capture the mood of the horse and rider stealing a moment of relaxation away from the bustle of a busy day. Friesen’s work has been in numerous juried exhibitions throughout Canada and in the U.S. In 1994 she won first and second place in the Canadian Association of Equine Artists and Supporters Juried Art Competition-- first for ‘Spirit in Hand’ and second for ‘Broodmares Under Oak Tree.’ In 1995 her painting ‘Dancing in the Light’ was accepted into the American Academy of Equine Art fall exhibition at the Kentucky Horse Park. Corporate and private commissions continue to provide an outlet for this artist’s insatiable desire to express her love of horses and the natural world. Her challenge today is juggling her work career, her art career and spending time with her husband and life partner, Ken, whose support she values greatly.